Web design and development is a major part of our world right now. The latest technologies that are being developed today are geared towards networking. The largest network in existence today is the internet. It’s so big that its ultimate size is immeasurable. 000webhost is an online platform that has considered the significance of web design and development and has provided an opportunity for upcoming web designers and developers to exercise, implement, and enhance their skills and knowledge in their respective fields. Anyone who is looking for free web hosting can also consider this platform. Below you’ll find an in-depth review of 000webhost so that you can see the role it plays in web design and development and determine whether it’ll be of any use to you as well. If you are curious about the three zeros that constitute the name of the platform, they are for emphasis. You actually read the name as “zero-web host”. In other words, free web hosting. 000webhost has been online since 2007 and has been providing free web hosting since its inception. Its free hosting has been unrivaled for years, and it’s the quality of free web hosting the site provides that has made it last for as long as it has. We are in 2018, and still, very few online places offer better hosting services for free. With 000webhost, you receive 1GB of free hard disk space as storage for your site assets, 10,000MB bandwidth, 2 MySQL databases that can support up to 150 tables, and 5 email forwarders. If you are working on a small project, or if you are looking for someplace to have some fun with what you’ve already learned about web design and development, I believe you’ll find the above features ideal; considering that they are indeed free. Something you’ll appreciate about the free site you get from 000webhost is that it’s ad-free. Most online places that offer free web hosting will come with the disadvantage of including their own ads on your site just because they allow you to host your site on their servers at no cost. 000webhost does not do this to you. They understand that in as much as you’d like free hosting services, you also have your own business and they are keen not to interfere with whatever it is you are up to. 000webhost also provides you with a free website builder. The website builder will enable you to build a website as fast as possible even if you don’t know how to code. Whether you have web design and development skills is irrelevant. The website builder is user-friendly and intuitive. Anyone with the determination to learn how it works will master it in no time. Be that as it may, I must admit that some web design basics will come in handy. Otherwise, with this simple tool, anyone can build a website. 000webhost doesn’t just give you a place to host your site for free, it also provides you with the tools necessary to build the site and have it up and running. As part of your free web hosting account, you’ll have access to a section called the cPanel. This section enables you to perform administrative tasks like managing MySQL databases, uploading the assets of your site as well as downloading them, setting up your domain names, among alternative site management functions. It is a powerful area of your account; perhaps the most powerful. It’s user-friendly and intuitive. Furthermore, in case of any challenges, 000webhost provides easy to follow tutorials that show what to do, where, and how. Nothing will be vague or confusing. The cPanel is a powerful section of your account because with just a single click you can erase the very existence of your site or project. It’s advised that one understands how this section of the site works to prevent any accidental moves. At only $7.95/month. 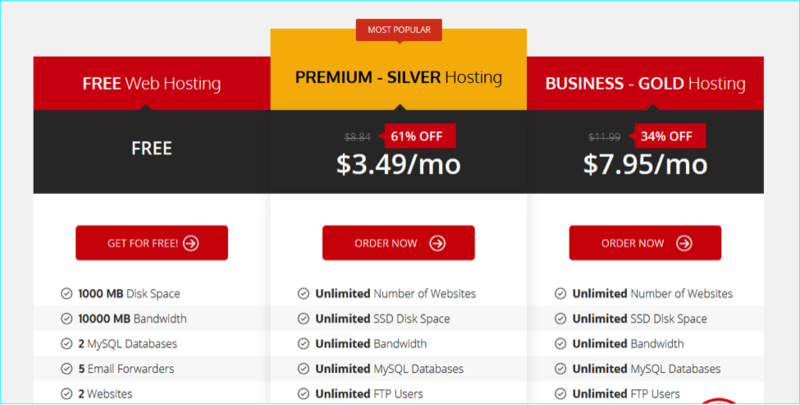 Considering the price these services are being offered, 000webhost is one of the most affordable web hosting platforms online. Don’t take my word for it, just Google “web hosting” and compare the prices of the sites that provide web hosting, and also look at the features they provide at those prices. One more thing, 000webhost also gives you a chance to make some extra money for yourself. The platform has an affiliate program. Once you sign up for your free account, you’ll also have access to your own affiliate link. The way this works is that you include the affiliate somewhere online where you have a lot of influence. I suggest either your social media networks like Facebook, Twitter and the likes or even your own free site at 000webhost if you already have good traffic. You will make some money whenever anyone signs up for the paid plans of the platform through any of your affiliate links. You have the potential of making up to $100 with each sign-up. How cool is that? Free accounts can be terminated without notice. Free accounts go offline for an hour every 24 hours. If you are an upcoming web designer or web developer, 000webhost is a good place to use as a lab for your projects – both big and small. If you are looking for somewhere to host your website, regardless of your background, you’ll find 000webhost to be a good place to start. If you are looking for pocket-friendly web hosting, you’ll find 000webhost to be one of your best options. You now have enough information to make an informed decision whether this online web hosting platform will work for you.